Download free Samsung Format utility V2.5 and format corrupted Samsung external hard drives .Learn how to format Samsung portable hard drive . 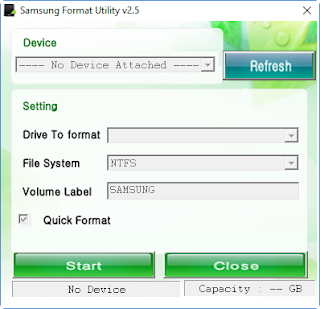 Samsung Format tool is a free portable software that provides formatting options for Samsung external HDD .It's a very small tool that can format the data of your Samsung external hard disk so easily with format options either NTFS or FAT32 File system .The software interface is so simple with no advanced options . Samsung external hard drive Formatter v2.5 can make a low level format for any Samsung portable HDD .Samsung format tool supports only Samsung external hard disks also can run on Windows 32bit or 64 bit . Warning ! : Using the Samsung Format Utility v2.5 will erase all data on Your external hard drive. Be sure that you have backed up all data from the external disk drive before running this utility. How to format Samsung external hard drive ? Download the Samsung Format Utility Software to your computer desktop. Right click on the zip file "Samsung_Format_Utility_v2.5.zip " and extract it to the Desktop . 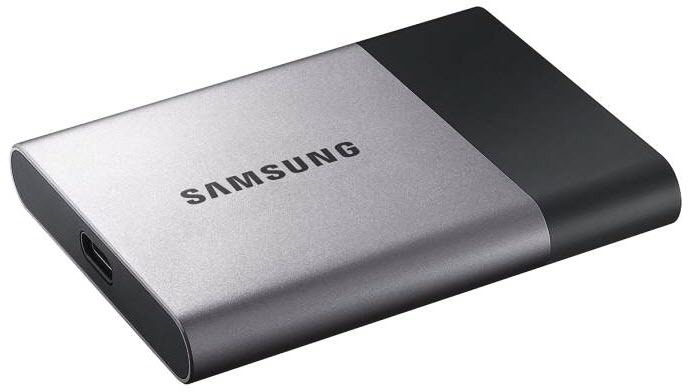 Connect the Samsung External hard drive to your PC . Click Refresh to identify your External hard disk on the software interface . From "Setting " choose the drive to format ,Format type "FAT32 or NTFS " . If you want to make a quick format so mark on "Quick Format " . Click "Start " To begin formatting Samsung External HDD . Note that : For other hard drives or portable HDD you can use other format tools , you can download it from here "Best 7 Free Disk Format Tools For Windows " .